The Joliet slip and fall accident attorneys of Rosenfeld Injury Lawyers LLC specialize in helping anyone who has been injured due to a fall, whether while on the job or because of premises liability. Slip, trip and fall injuries are some of the most common and severe injuries reported and can quickly change the victim's life forever. To help you move forward with your life after such an accident, we can explore all legal avenues available to recover the compensation you need to pay for medical expenses, out of pocket costs, lost wages and your pain and suffering. Most people associate slip and fall accidents with the workplace, but our Joliet slip and fall injury lawyers have helped people recover compensation from disasters resulting from poor building maintenance, defects in sidewalks and pavement, missing handrails, defective staircases, poorly lit halls and more. Here are some of the most common types of accidents in Joliet. Slips due to ice or hazards— it is the responsibility of property owners to keep walkways and paths clear of ice, debris and other dangers that can pose a threat to public safety. When someone is injured in a fall due to poor maintenance of the grounds, the owner may be liable. Falls in elevators— defective elevator doors can expose people to fall hazards, and serious injuries can result. If the victim survives, he or she may be changed for the rest of his or her life. Poor lighting— some tripping and falling accidents are caused by dimly lit halls or stairs. When people are unable to see objects on the ground, they are more likely to be injured by tripping over them and falling. Defects in the pavement— potholes are not just a hazard for vehicles. They can be a source of injury to those who step into them. From tripping to twisting or breaking an ankle, it is possible to suffer an injury severe enough to set you back a significant amount of time and money. 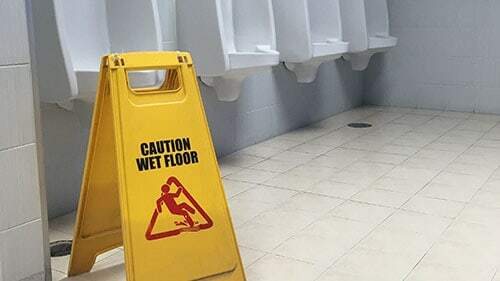 Slippery floors— when maintenance staff does not warn people of wet floors, it is possible for them to slip and fall, causing severe injuries when hitting the floor. Poorly maintained balconies— in addition to missing or broken guardrails, balconies that are not able to withstand the weight of their occupants can cause harm when they collapse. Uneven sidewalks— uneven sidewalks can create hazards by making it more likely that a person will trip or place his or her foot down at an awkward angle. Workplace slip, trip, and fall accidents— there are numerous hazards found on the job, and many of them can cause workers to trip or to fall from great heights. These types of accidents can cause some different injuries depending on the type of surface, the height of the fall and other factors unique to your situation. Some of the most common injuries include the following. Traumatic brain injuries— sudden trauma to the head can cause microtears in the brain that swell with blood and fluids. Over time, this can cause long-term loss of cognitive function. Fractures— broken bones are common in slip or fall accidents, and they may require extensive medical treatment to repair if they are severe. Even in the best cases, victims need to keep the affected limb immobilized for an extended period, making it difficult to return to work. Neural retinopathy— damage to the nerves can result in diminished motor function, loss of feeling or severe pain. Injuries to the back— a fall can easily cause injuries to the back such as herniated discs, broken vertebrae, or a fractured spine. Death— falls from great heights can result in life-ending injuries, and the families of victims deserve fair compensation for the financial contributions of their lost ones. It is the responsibility of property owners to take all reasonable steps necessary to provide a safe environment to those using the building. If the owners or building management knew of a hazard or did not perform routine maintenance, victims may be able to file a lawsuit for the recovery of damages. Rosenfeld Injury Lawyers LLC has recovered damages for thousands of clients in the Joliet area. In addition to working with insurance companies, we can determine whether you can file a claim against negligent property owners so that you can afford the quality medical care you need, meet your financial obligations during your recovery and afford any out of pocket expenses that you may incur while you are going through rehabilitation. Contact us today to be connected with one of our award-winning Joliet slip and fall accident attorneys so that we can investigate your claim and review your legal options. If we are unable to recover compensation on your behalf, you are assured that our time and services will cost you nothing.